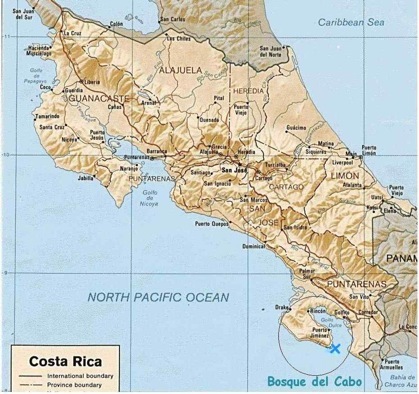 Costa Rica is located in southern Central America, below Nicaragua and above Panama. It is bordered to the west by the Pacific Ocean and to the east by the Caribbean Sea. Its capital city is San Jose, which is located in roughly the center of the country. Bosque del Cabo is located approximately 200 miles from San Jose, at the very tip of the Osa Peninsula. The Osa is Costa Rica's southernmost peninsula on the Pacific Ocean side, located just above Panama. There is a large gulf between the peninsula and the mainland, called the Golfo Dulce (“sweet gulf”). The largest town on the Osa Peninsula is Puerto Jimenez (population approximately 4000); across the gulf from Jimenez is the port town of Golfito. Bosque del Cabo lies 22 kilometers south of Puerto Jimenez (about a 45 minute 4-wheel drive ride). The lodge sits atop Cabo Matapalo, on the road halfway between Puerto Jimenez and Corcovado National Park. The Osa Peninsula is a unique and fascinating place, rich with colorful local characters and tales of adventure. Only a few years ago, the Osa was very difficult to access. This was partly due to the bad condition (or non-existence) of the roads, and partly due to the dense rainforests that covers the area. The Osa was mostly inhabited by gold miners, looking for their fortunes in the rivers of the peninsula. These people were a hardy stock, perhaps much like the settlers of the "Wild West" in the United States. In 1975, Costa Rica placed 1/3 of the landmass of the Osa Peninsula (approximately 100,000 acres) into protected status as a national park, Corcovado National Park. Today, 3/4 of the Osa Peninsula is either national park or forest reserve, yet the Osa remains the most uninhabited and untamed part of Costa Rica. 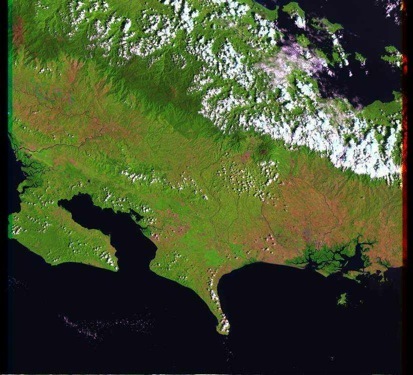 "Picture of Costa Rica and the Osa Peninsula (upper peninsula shown) taken from space"